Astana Arena is a 30,000 capacity arena which opened in 2011 as the national football stadium for Kazakhstan. Designed by Populous and located within the capital city, the stadium is notable for featuring a retractable roof. Constructed over a two year period between 2007 and 2009, Astana Arena is the largest stadium in Kazakhstan and one of the most modern national stadiums in the world. 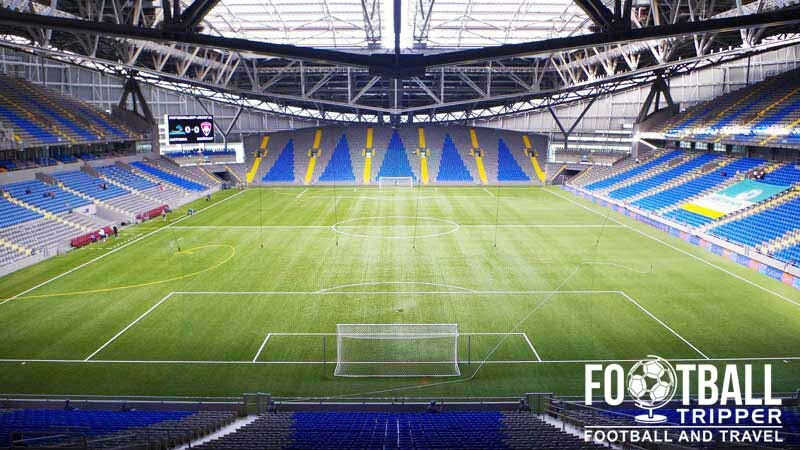 Designed by Populous who famously lent a hand to Wembley Stadium and The Emirates in England, the stadium features a fully retractable roof. The inaugural fixture was played on 3rd July 2009 between local side Lokomotiv Astana and the Kazakhstan Under 21 national team.The match was officiated by the Italian referee Pierluigi Collina who is one of the most famous football officials of all time. To help make the game a little more interested both sides were allowed to call up two “star” players. Kazakhstan Under 21s opted for two former AC Milan players, Kakha Kaladze and Andriy Shevchenko whereas local side Lokomotiv enlisted the services of Turkish Internationals Hasan Şaş and Hakan Şükür. Astana Arena’s multi-purpose sporting credentials were confirmed when the venue was used to host the opening ceremony of the Asian Winter Games in January 2011. 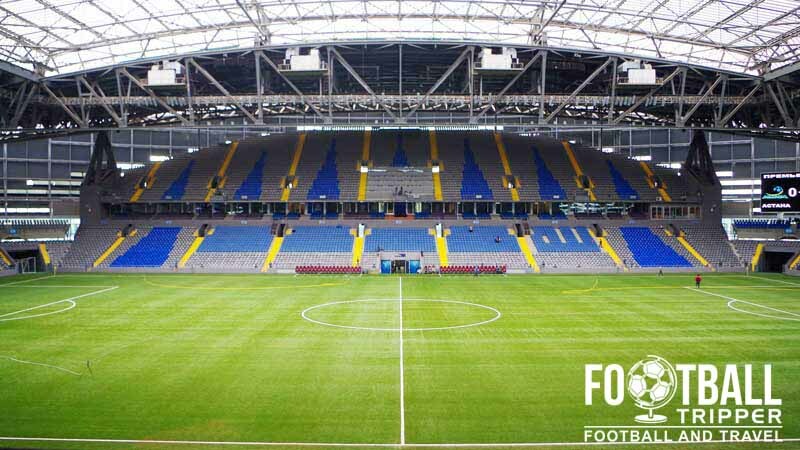 Hoping to build upon this event, Kazakhstan bid to host matches of Euro 2020 at Astana Arena but city was sadly unsuccessful in its application. When Celtic played Shakhter Karagandy in a Champions League qualifier back in 2013, the 30 or so dedicated supporters who made the trip to Kazakhstan were housed within the south stand with the home fans. 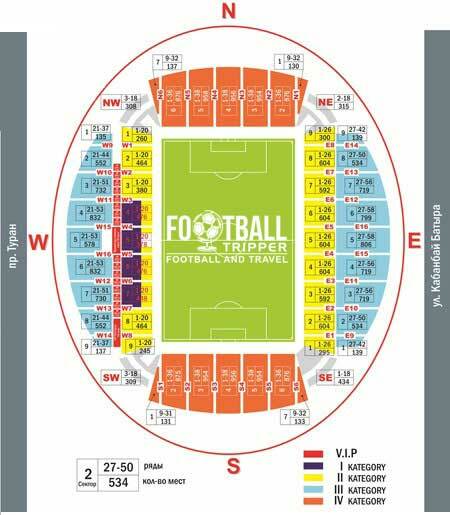 For matches where the travelling contingent is expected to be larger, away fans generally occupy one or two blocks in the south-west corner. There are plenty of bars within the city centre to keep you entertained both before and after the match. On matchdays there are usually vendors around the stadium selling souvenirs and merchandise. 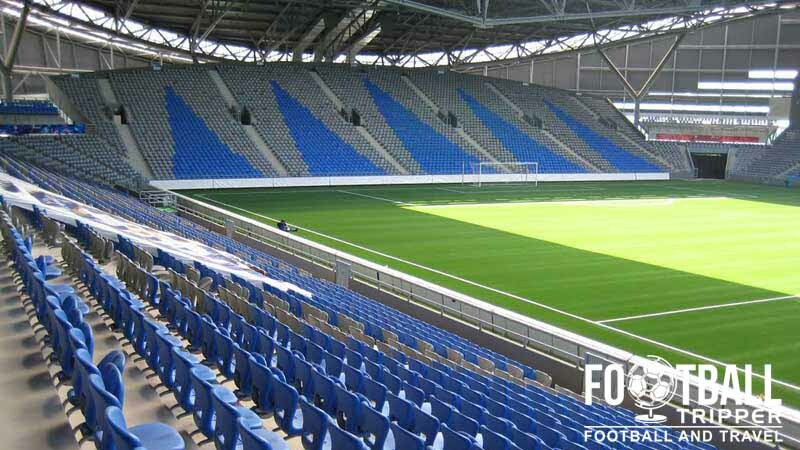 It doesn’t appear as the City of Astana currently conduct stadium tours of Astana Arena. If this changes we’ll be sure to update this section. 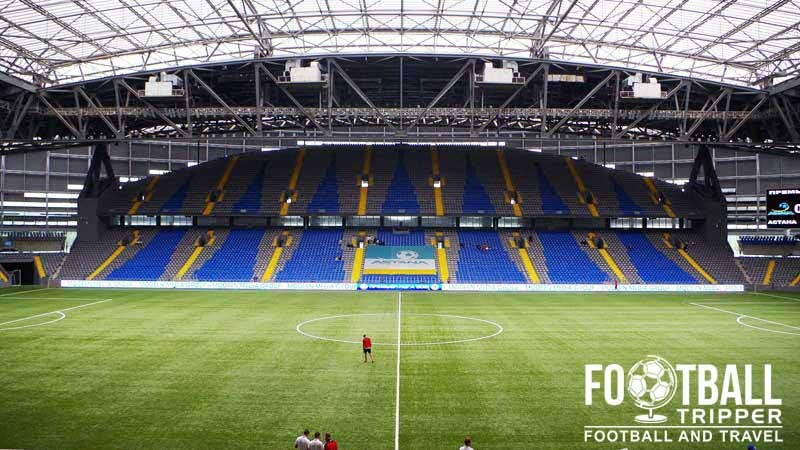 For league matches Astana Arena is never often sold out so tickets can generally be purchased at the box office before kick-off in most cases. When it comes to International matches you should always purchase your tickets in advance through your country’s football association. Kazakhstan’s national stadium is located next to Nazarbayev University out of town approximately 9.3 km from Astana’s city centre. Buses and marshrutkas form the backbone of the city’s public transport. Follow the red brick road. We’re assuming it’s nothing to do with Coca-Cola! There are two reasonably large car parks located east of the stadium which can be accessed from Qabanbay Batyr Avenue. Kazakthan Railroad infrastructure as a whole is relatively underdeveloped which means that the main station of the city only serves around 7,000 people a day. There are subsequently plans to tentatively construct a light metro system in 2016. The stadium is ultra modern compared to a lot of the cars and buildings within Kazakhstan which makes for a great contrast. Astana Arena has its own bus stop of the same name which is bus routes 10, 27, 30, 40, 41 and 43. Astana International Airport, the second busiest airport in Kazakhtan, is located 17 km south-east of the city centre. Construction is currently underway on a new terminal in anticipation of the growth of passengers traffic by 2017. The closest accommodation options to the stadium are Royal Park and Astana Hotel followed by the Seven Inn Boutique. The city centre has three other places worthy of inspection: Comfort Hotel, Tengri Hotel, and Hotel Kazzhol.